FRANCO'S GREATEST HITS! The Graphic Art of Franco Frescura will be opening at The Phansi Museum on October 6, 2018, at Phansi Museum at 10h00. All are welcome and entry is free. The exhibition will feature the political graphics of Franco Frescura, mostly drawn in the 1970s and published in the student press, the Council of Churches, and SPROCAS. The exhibition will be introduced by Lesley Frescura, Franco’s wife and sometime uncredited collaborator. Lesley was also formerly involved in human rights through her work with Amnesty International South Africa, the Black Sash Eastern Cape, the Human Rights Trust in Port Elizabeth, and the Lawyers for Human Rights in Pretoria. Over the past 20 years, the role of white activists in the struggle against apartheid has been largely overlooked by modern historians. Because of the secretive nature of their work, many of its details are either unrecorded or have been lost to State censorship, and the contributions of such people as Neville and Jenny Curtis, Horst Kleinschmidt, Neil Aggett and David Webster have not been fully documented. Drawings, on the other hand, are hard documents that record many of the ideas, actions and events of that era which the Apartheid police failed to obliterate and the bluster of politicians has pointedly ignored. Although the drawings in this exhibition are the work of one person, behind him stand many members of a non-racial South African community that included students, trade unions, women’s groups, academia, church groups, development professionals and human rights NGOs, together with their families, friends and supporters. 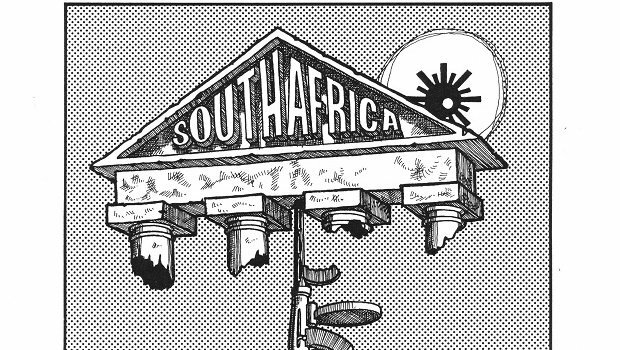 Although Franco eventually joined the ANC underground in the early 1980s, his work in the field of rural indigenous architecture also continued to undermine the precepts of a racist, bigoted patriarchy whose minority rule ran counter to all ideals of a South African democracy. It was through his graphics that he was able to demonstrate how it is possible to oppose an all-powerful military-industrial establishment without resorting to violent action. 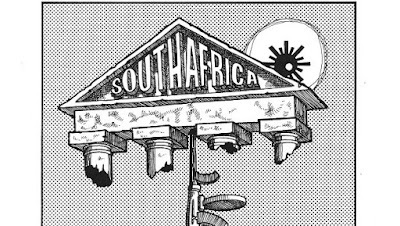 These drawings thus stand as a visual testimony of the struggle against apartheid ran that deep within the communities in South Africa and who sacrificed much in its opposition.